Kate Gilmore ’97 suffers for her art. More impressively, she suffers during her art, such as when she famously dipped her leg into a bucket of plaster and, after it hardened, used a hammer to whack it off. He’s not the only one, as Gilmore is in the midst of a remarkably successful and busy artistic career. Her work is about more than just suspense. It also comments on the traditional masculine-feminine divide in art history. 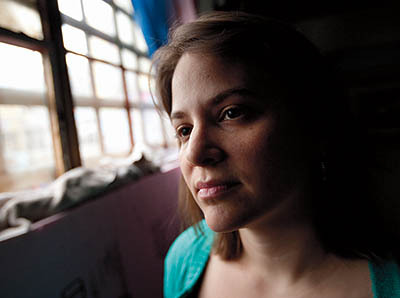 Her work has been purchased by the Museum of Modern Art, and she’s exhibited at any number of important venues, including the Institute of Contemporary Art in Philadelphia, the J. Paul Getty Museum in Los Angeles, and PS1 Contemporary Art Center and the Brooklyn Museum of Art in New York City. Her work is also exhibited overseas, and in 2007 she won a prestigious Rome Prize for emerging artists, funding a year at the American Academy there (a reminder that there are some perks in the art world). 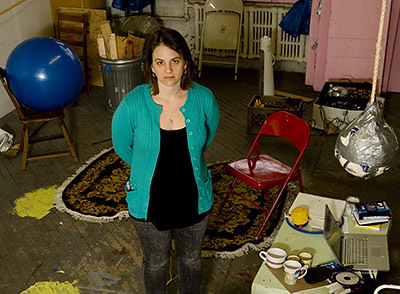 Gilmore lives in Manhattan’s Chelsea neighborhood — her husband is Andrew Cyr ’96, artistic director of the Metropolis Ensemble — and takes the train out to Long Island City in Queens, where she works in a graffiti-covered building that was once a factory. There, she keeps a studio full of tools and props from videos past, present, and future and spends her time organizing work that is increasingly elaborate. While the final product is simply a DVD of her performance — she films with a high-end consumer Panasonic camera and edits with Final Cut Pro — arriving at that endpoint is hardly easy. The video artist is the producer, prop builder, editor, director, lighting designer, and performer. “I can spend two weeks on lighting alone,” says Gilmore, explaining that countless decisions affect the way the video looks and feels. “I’m not just interested in documenting some event. The color’s really important. So are forms of the objects involved, the setting, and how I look and how my outfit looks.” Such visual sensibilities were honed partly at Bates, where Gilmore studied painting with Robert Feintuch and sculpture with Paul Heroux, an experience that informs how she goes about designing and constructing sets for her performances. In 2002, Gilmore received an M.F.A. from the School of Visual Arts in Manhattan. Success only complicates things. As institutions commission work from Gilmore, her performances can become more expansive and expensive. But however complex the project, Gilmore remains the star, often seen in stereotypically feminine attire and makeup while carrying out what she describes as “Herculean” tasks. As a result, her videos have their own fascinating rhetorical logic — we watch because we want to find out what happens. But her work is also about more than just suspense: It also comments on the traditional masculine-feminine divide in art history. 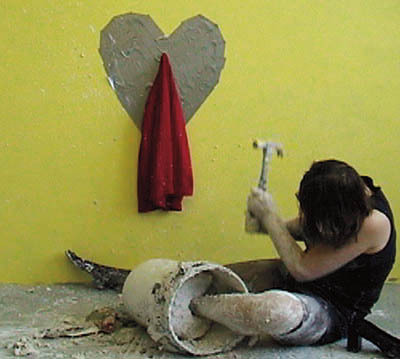 In one video she uses a ramshackle collection of chairs to build a pyramid, which she climbs; the viewer sees the action from a camera mounted above the scene. As she ties the chairs together with twine and moves tentatively up the makeshift mound, occasionally extending one straining hand toward the camera, the viewer is both nervous and excited. The actual shooting, done without a live audience, has a similar momentousness, she adds. “It’s very scary” because “it’s a one-shot deal. If this is bad, this is my show.” Her latest work ran into a little unexpected trouble, she explains: “Someone outside started banging on the window with a key.” But it was nothing a little improvising and editing couldn’t sort out. Gilmore is still recognized for her video with her leg in plaster. “I’m the bucket girl,” she laughs. “I’m dressed in this black cocktail outfit, and the whole video is me trying to get my foot out of this bucket of plaster. She figured the plaster would break if she just banged it against the wall a couple of times. “That was Fear Factor meets the art world.” She now films her videos with somebody around. David Coggins ’97 is a writer and artist who lives in New York.